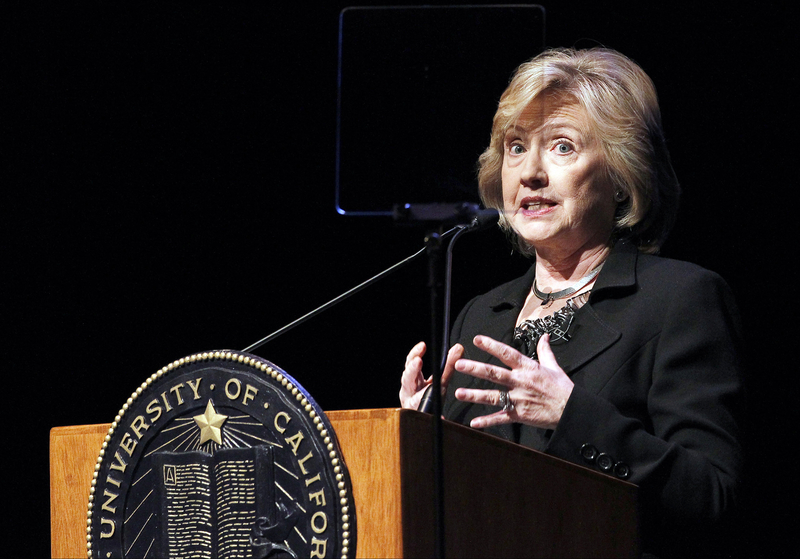 Before Hillary Clinton spoke at the University of California at Los Angeles in March, her representatives had a few specifications to negotiate with school officials. A team at the Harry Walker Agency, a speaker's bureau handling Clinton's appearance, requested snacks in the green room ("diet ginger ale, crudité, hummus, and sliced fruit," they wrote in an email obtained by the Washington Post.) They described her preferred onstage refreshments (water, both hot and room temperature, and lemon wedges). They specified the type of chair Clinton should be sitting in during part of her appearance, and the type of pillows to be placed on that chair (long and rectangular, with an additional pillow backstage for added support, if needed.) They even requested that a medal being presented to Clinton be given in a box instead of being draped around her neck. And of course, there was the matter of Clinton's $300,000 speaking fee. When officials asked for a price reduction on behalf of the public university, Clinton's representatives didn't budge, saying $300,000 was already the "special university rate." The emails exchanged between school officials and Clinton's team, obtained by the Post under a Freedom of Information Act request, shed new light on the intense choreography behind Clinton's lucrative turn on the speaking circuit. But as Clinton approaches a potential 2016 presidential bid, some are wondering whether the exacting requirements and hefty price tags attached to her speeches could undermine a campaign message focused on economic populism and middle class opportunity. Clinton's team has emphasized that the money she earns speaking at universities does not go to her personally - she donates it to the Bill, Hillary, and Chelsea Clinton Foundation, the eponymous charity organization she runs with her husband and daughter. But that hasn't always quieted the criticism. This summer, students at the University of Nevada at Las Vegas protested a $225,000 speech planned for October, citing the rising cost of tuition and asking Clinton to return the money to the school. The speech, which focused in part on the rising cost of higher education, ultimately went forward as planned. The money for many of Clinton's university speeches does not come directly out of school coffers: the speech at UCLA, for example, was privately funded as part of a lecture series endowed by a private investor. Her appearance at UNLV was funded by the nonprofit foundation associated with the school, rather than the school itself. And that speech, which swelled donations at the foundation's annual fundraising dinner, more than paid for itself, officials noted. UCLA Communications Director Jean-Paul Renaud brushed aside any suggestion that Clinton's speech wasn't worth the cost, telling the Post that the university acted "as a responsible steward of financial resources." Since leaving the White House in 2001, the Clintons have amassed a fortune giving speeches, many of which were delivered before private companies and trade associations. Bill Clinton alone earned $104.9 million giving 452 speeches beetween 2001 and 2013, according to the Washington Post.